Our 1st ride of the year we will start at Tonbridge. 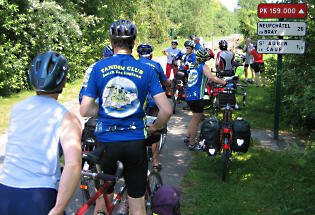 The ride will be about 30 miles. 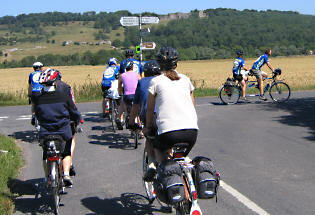 The first 5 miles to Penshurst will be largely traffic free and flat, following the Sustrans route opened this summer. 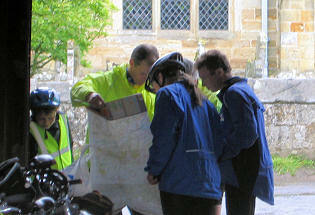 We will have a coffee stop in Chiddingstone. Then head south to Hartfield for a pub lunch and a visit to the Whinny the Pooh shop. 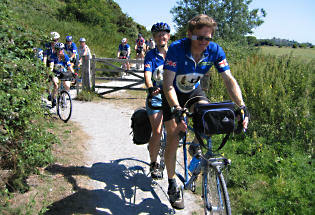 The return route will include a section of the Forest Way old railway line. Contact: Cliff & Pauline - 01732 750885. 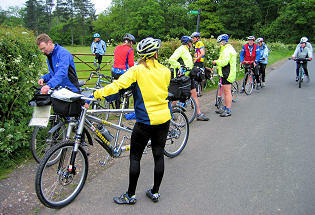 Our first ride of the year started in Tonbridge Park on a cold but dry morning. 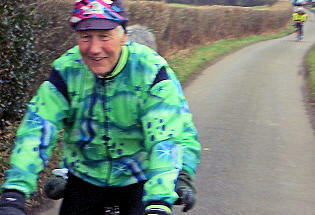 We rode south through Speldhurst and Langton Green looking for the signs of spring starting. The birds were certainly singing well. Stopped for a late elevenses at the Forge wood tea rooms. A converted barn in pleasant surroundings, but an unbelievably slow service. Now heading for Groombridge to ride a short flat section along the old railway before heading up hill to lunch at the Sussex Oak. 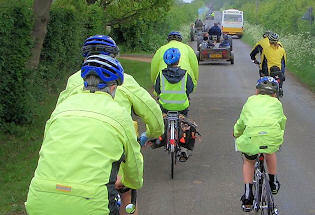 After our refreshments we set off towards Penshurst to use the new cycleway back to Tonbridge. Like most “traffic free” routes there were quite a few barriers to negotiate which Mark and Liz had to lift over, as their handlebars are too wide. This makes it harder going than necessary. A very pleasant day, returning to the car park at 4.30pm after 32 miles. 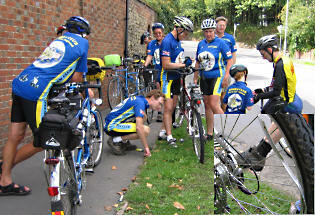 The additional 8 miles to cycle home was made more tiring as the gear cable snapped on us. That was our end of day treat! We intend to start at Reculver and cycle along the sea front to Westgate before heading south to Manston airport’s Spitfire museum for coffee. We shall then follow the Stour valley towards Littlebourne for a pub for lunch. The return will be via the intriguingly named, Knave’s Ash, Shelvingford and Under the Wood. Approx. 32 miles. 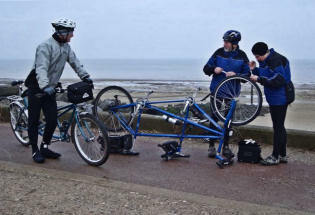 Five tandems and a solo met at Reculver on a very cold morning. We headed along the sea wall with views of Brent Geese, Turnstone, Redshank and Snowbunting. Liz and Ken got a puncture which gave Christopher a chance to climb all over the rocks, placed as sea defences. At Westgate we headed inland for our morning coffee and respite from the wind at Manston Spitfire museum. 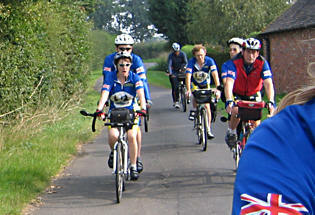 With the wind behind us we rode along the flat country lanes out to Preston, where we were joined by Jeff, Madge and my mum. Which swelled our numbers to 14 for lunch. Jeff and Madge, now in their 90’s haven’t ridden for a couple of years (after Jeff had a fall, although he is riding solo again now), so it was good to see them again. So, a challenge to anyone that has ridden with the group in the past to renew their acquaintance, even if they just join us for lunch. You will be very welcome. It had started raining just before we reached the pub and it continued to do so all afternoon. We had the strengthening wind on our backs as we headed to Fordwich, but the return to Reculver, into the wet wind ensured we finished rather damp. The start will be at Ditton. Coffee will be at Nepicar Farm (A25 at Wrotham Heath), then on to Man of Kent at East Peckham, for lunch. For more details ring Mark and Liz. 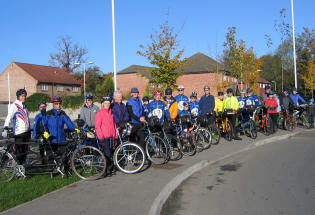 Six tandems set off from Ditton Community Centre on a bright but windy morning. We cycled through country lanes taking us through East Malling, West Malling and Offham, which eventually lead us to our coffee stop at Nepicar Farm. Due to it being so early in the year the farm was not busy, so plenty of space for us to enjoy refreshments and a bite to eat. There were baby lambs enjoying the spring sunshine. Refuelled we headed towards Plaxtol where the lovely country views had to be paid for by climbing some short but steep hills. Still it kept us warm and helped us build an appetite for lunch. Lunch stop was at the Man of Kent, East Peckham, a 16th Century Country Inn where we could see brown trout in the stream running alongside the pub. Ducking to enter the bar, as the oak beamed ceilings were so low - we had a warm welcome as there was a log fire burning. We enjoyed a good meal. We then turned towards Paddock Wood and weaved our way through country lanes towards Wateringbury, where we climbed Red Hill and then along Sweets Lane back to Ditton for tea and cakes at Mark and Liz’s house. 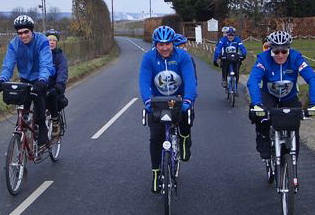 Total distance covered was 35 miles averaging 12.2mph, maximum speed clocked 38.5mph. A good day with good company. 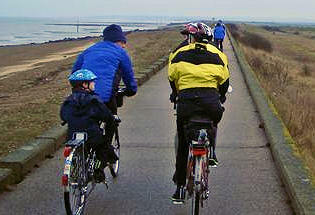 30 miles, at a pace particularly suited for family participation. Ring John and Denise for more info. Contact: John & Denise - 01892 863070. NEW LEADER MAKES GREAT DEBUT! What fine weather! What scenery! What a quiet route! What views! What flat cycling! What a leader! Well if only those things were true. The bit about the leader was of course true but it was hilly, it rained a lot and that made the scenery difficult to appreciate. However the company was great and very friendly. 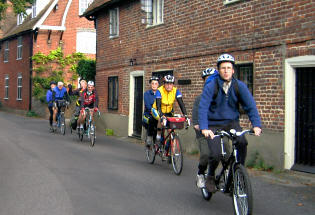 Fourteen people (3 of whom were children) on 6 tandems and 2 solos met at the leader's house in Langton Green near Tunbridge Wells. 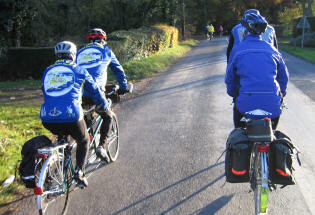 Being my first Tandem club ride, the first thing I noticed (as leader) different to the CTC was that everyone had phoned in advance and the second thing was that everyone turned up early to start promptly on time!!! We left in fine weather and via Fordcombe went to Chiddingstone for elevenses. I was a bit concerned when I saw the entire Church congregation saying prayers outside the barred up entrance to the coffee shop. Seems to be some kind of custom. Anyway we were duly served and afterwards headed via the Weald to Ightham Mote for lunch. How resplendent it now looks after its restoration. En route the heavens opened and then closed when we went into lunch! 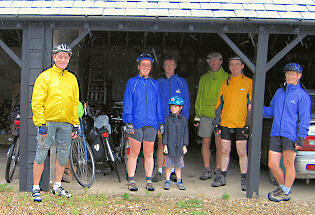 Afterwards we headed down to Hildenborough, Haysden Lakes, and home for a soggy cup of tea. After 31 quality miles it was well earnt. 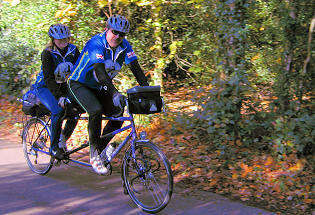 The great thing about the Tandem Club is it’s friendliness and sociability and this ride was no exception. Thanks to everyone for making it so enjoyable. Contact: Alan & Wendy - 01621 818060. This was another really well organised and enjoyable four day event in France with good riding, good weather and good food. 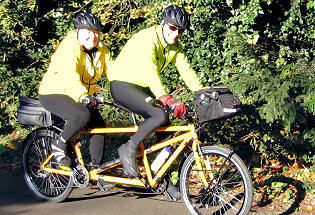 For a full report and pictures, look at the Tandem Club - South East London website. 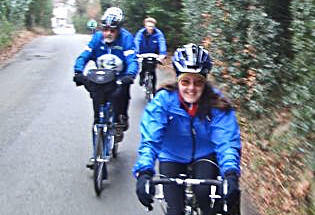 Mark, Liz and Jake will lead us around the lanes of Kent. Starting at Marden. Coffee will be at the Headcorn Aerodrome. This is to be a family ride but all are welcome. 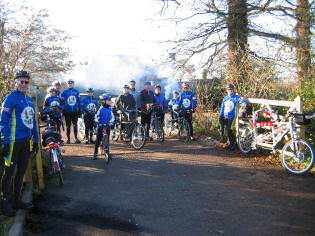 Seven tandems and one solo met at Marden Station for this easy/family ride. The weather was dry but overcast. 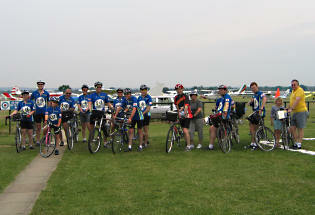 We proceeded 11 miles through quiet lanes to arrive at Headcorn Aerodrome for tea. The weather had warmed up and we were able to have our tea and cakes outside on the grass and watch the planes coming and going. 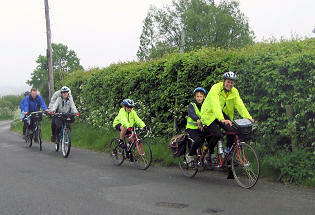 Robert and Michaela arrived on their tandem, while Julie, Kimberley and Michelle arrived in the car and joined us for our tea break. We then continued cycling through the lanes for a further 8 miles to our lunch stop at ‘The Wild Duck’ pub in Staplehurst. 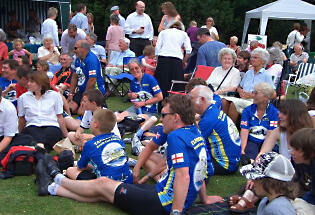 From here we cycled to Sheephurst Farm in Claygate where the East Peckham Silver Band were playing at a garden party. As well as the Silver Band, there were old cars and bikes on display, Morris dancers, pipers and local fare to be bought along with beers, wines and teas. 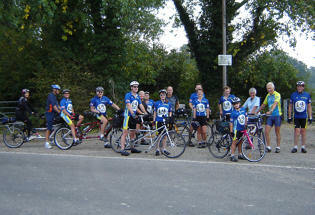 After an enjoyable hour we headed back to Marden Station having cycled 25.7 miles. 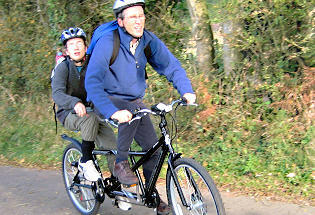 Thanks to all that attended and a big welcome to Colin and Mon for which this was their first Tandem Club ride, we hope we’ll see you again. We will be based at Romney Farm Campsite, Romney Road, Lydd, Kent TN29 9LS. Camping fees are £15 per unit per night and an extra £3 per night for a hook up. Please book directly with the campsite (tel: 01797 361499). Tell them you are with the tandem group and they will attempt to put us together. For details see this website. We are hoping that anyone joining us just for the Sunday ride will be able to park on site in the car park, this will depend on how busy they are. Contact: Cliff & Pauline - 01732 750885 or 07977 913071. 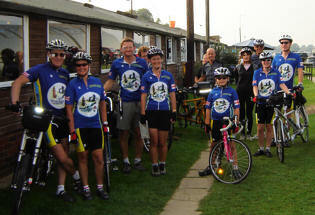 Eight tandems and 2 solos gathered at 10 o’clock at Romney Farm campsite for a tour around the marshes. After a short delay whilst Mark eventually fathomed out that the reason that he could not get his shoes to clip into his pedals was that he had put on the wrong shoes, we set off through the quaint, but busy, old town of New Romney. Inland to St Mary in the Marsh, before returning to the coast at Dymchurch, with its fair grounds and bucket and spade shops. In our enthusiasm to get out as quickly as possible, we took a left turn too soon, and as a result had a tour around a small housing estate before finding the required road towards the Lathe Barn tea rooms - only to find it closed Saturday mornings. So a change to the route was quickly arranged, to take us into Hythe, for tea at the Railway’s café. This required us to retrace our steps back to St Botolph’s Bridge. The pub’s claim to fame, being the headquarters of Dr. Syn’s gang of smugglers. 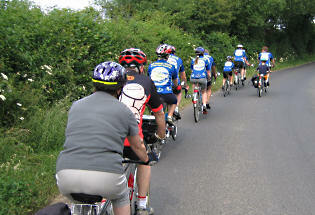 Our route to Newchurch was against the flow of a considerable number of sponsored cyclists ‘riding for Rhinos’. We could see Port Lympne (the zoo responsible for the event), on the hills to our north, along with the remains of Stutfall Castle and the impressive Lympne Castle. I think we confused many a marshall seeing us coming from the wrong direction. The only hill of the day took us up to the pub at Bilsington. They were not doing food on Saturday. Fortunately, just a mile along the road at Ruckinge, the Pub could accommodate us. Unfortunately, we failed to appreciate the importance of the notice outside, that proclaimed ‘New Chef’. ‘New chef, with attitude’ is what it should have said. So after a long delay we returned to the campsite via Ivychurch, Brenzett and Brookland. 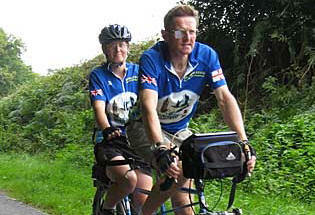 Special mention must go to John and Jean who had not ridden with us before, being unable to ride on Sundays, and completed a ride some three times their normal daily distance. The evening was finished off with a barbeque. With David, Caroline and Christopher replacing John and Jean we headed off with a tail wind through fields of hares towards Lydd and Camber. 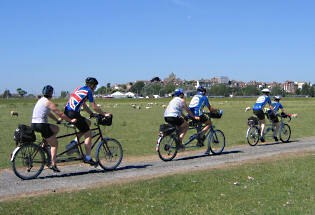 After Camber, with the traffic getting heavier we took the cycle path into Rye. This continues on the far side of Rye on a pleasant path towards Winchelsea. It is somewhat spoilt however, by a large number of totally unnecessary gates. The climb into Winchelsea meant we were gasping for that tea stop. As you may have guessed, it was closed. So we made do with an ice cream from the shop and sat in the sunshine. 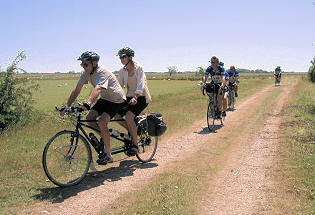 We returned to Rye along a bridleway that follows the Royal Military canal, past the ruins of Camber castle. 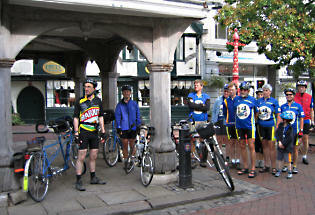 We split up in Rye, some going to the Harbour for a picnic, others to pubs or to try to find an elusive ‘open’ tea shop. Meeting up again at the arranged recreation ground we headed north across the river Rother and up an ‘extortionate’ hill. Actually it was only a 50 metre climb but after so long ‘on the level’ it came as a surprise to many. The second, rather pleasant surprise was to stumble across a classic car rally in Appledore. So we enjoyed tea and cake whilst looking at the splendid old cars and bikes. With the rally closing at 4, it was time for us to return to camp. Thanks to everyone who came and supported. A special mention must go to 10 year old Jake. After a weekend total of about 80 miles he was still riding around the campsite, running to fetch water and helping us to pack up. Kevin and Kate from Faversham will give us a good tour around the East side of Kent. Contact: Kevin & Kate - 01795 537648. Five tandems and two solos gathered at the Guildhall in Faversham pondering the reason for the strange ring structures on the side of the building. 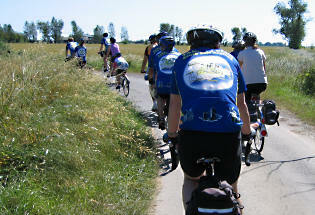 Philosophising over, we set off along the lanes south of Faversham. Kevin led us along the narrowest roads he could find. A very pleasant undulating route over the North Downs. Heavy rain the previous few days had washed a lot of gravel and soil across a number of these small lanes, which increased the excitement of some of the bends on the descents. 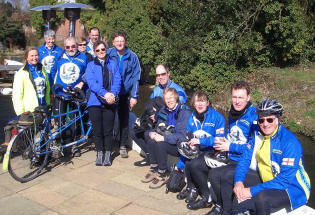 The tea stop was at Badgers’ Hill Farm garden centre, outside Chilham. With the added interest of also being the stopping place for a classic car rally. The garden centre also had Wallabies and Rheas, as well as a vast number of wind chimes. With them all ringing together they sounded quite musical, although I don’t suppose I would feel the same way listening to them for more than a coffee stop! After tea, we headed for Canterbury. The old railway crossing at Bagham is not the same now that they have replaced the old gates with modern barriers and you do not have to ring the bell and wait for the old man to emerge from his caravan to open the gates for you. Such is the price of progress. Just after Waltham we were caught in the storm that had threatened since our tea break. Sheltering under the eaves of a building a kind chap came out and suggested we shelter in his garage. The rain did not last long and we set off along the Roman road into Canterbury, emulating the ‘Tour of Britain’ riders that the signs say are coming this way. We lunched at the Pizza Express. We had window seats that overhung the river below, so, while we waited for our meals, lads rowing boatloads of people along the river entertained us. Canterbury is hardly Venice, Cambridge even, but the boat trips seemed quite popular nonetheless. We were on the outskirts of Canterbury, riding up Tyler Hill when a loud explosion from 100 metres behind indicated something was wrong. It was very loud at a distance, so what Trish and Neville must have thought when their rear rim exploded I don’t know. Once they had got over the shock, they were left with little option but to walk back to the station and catch a train back to Faversham. Easier said than done, particularly with a Sunday service. For the rest of us, we continued north through Herne, at a brisk pace towards Whitstable, where closed roads meant an alteration to the intended route. 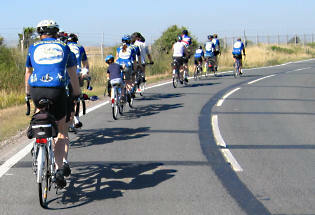 Heading west made us realise how much help we had received from the wind on the outward part of the ride. 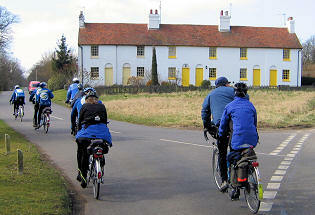 The wind was particularly strong along the coast at Seasalter, so some rather weary cyclists gathered at our leader’s house, but were soon refreshed by Kate’s tea and excellent homemade cakes. Once Trish and Neville had arrived, still looking shell-shocked, Kevin went beyond his duties as leader, by giving them a lift back to their campsite so they could retrieve the van. 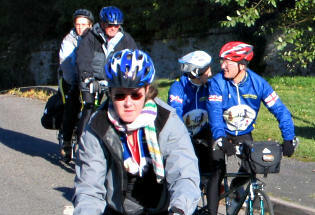 Our thanks to Kevin for leading an excellent ride and to Kate for her hospitality at the end. Meet 9.45 for 10.00am start. Ride distance approx. 40 miles. We will be heading from Marden to Headcorn for coffee. 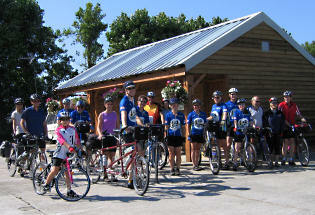 If you want a shorter ride of approx 25 miles join us at coffee.Just give us a call for more details. 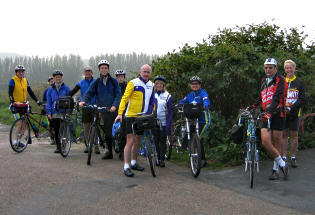 We met at Marden Station, 6 tandems and 2 solos, the start of the day was quite hazy, but the sun did come out and was very warm. We headed out of Marden north to Stile Bridge. Now south east through Rabbit’s Cross but not quite making it to Lamb’s Cross. What wonderful names? This was along lovely country lanes, with some of the trees starting to show signs of autumn, but the show of dahlias in some gardens was just brilliant. On to Headcorn for coffee, where John and Jean met us. 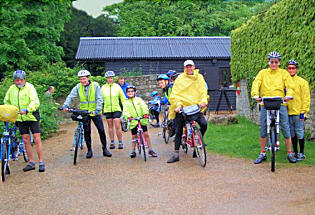 Once all revived with refreshments we then headed south west to Frittenden and Sissinghurst. Then the main hills of the day before reaching Benenden for lunch. Maurice and Rita left us at this point as our ride passed their house, they decided to stay there, having ridden to the start. The rest of us headed for the Aerodrome at Headcorn for afternoon tea, or ice creams and watched the aeroplanes come and go and the parachutists swirling above our heads. 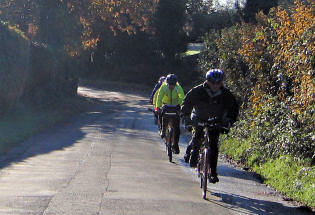 Come and enjoy a 35 mile autumn ride down the Elham Valley. 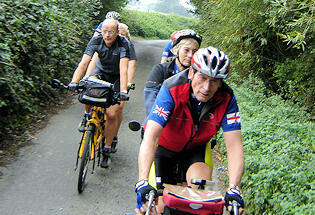 Arriving at Bekesbourne station, near Canterbury, we were very pleased to find Bob and Alison had come to join us. 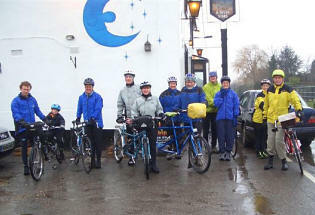 We had chanced to meet them at our coffee stop last month and they had taken up our offer to come and join us. We also welcomed Nick and his son Simon who had discovered us from our website. 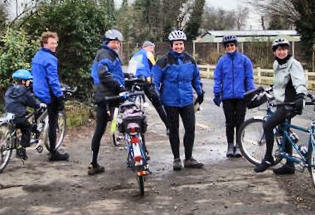 So six tandems, led by Peter and Sally headed South on the NCN route 17 through Bridge and Elham. It wasn’t long before we were stripping off layers due to unseasonably brilliant sunshine and blue skies. We left the route to head for Rhodes Minnis and Coffee at the Pet rescue centre. It was a comparatively short ride to lunch at the excellent Chequers Inn, at Petham. Bob and Ali left us here (after lunch) to ride back to Ashford. The outward ride had taken us along some nice flat valleys, interspersed by some sudden steep climbs (The first of these, resulted in Nick breaking his chain and was thankful to Neville for efficiently repairing the chain.) The return route followed the same pattern of sudden steep climbs and descents along with quiet rural roads, past the old tower of the long deceased windmill at Westwood, down to Kingston. 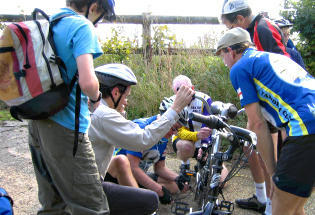 More chain problems, this time with Henry and Maureen’s tandem, proved to be just a derailment, so we were soon heading off, through Bridge, to pick up our outward route back to the station. Approximately 35 miles with a coffee stop and pub lunch. 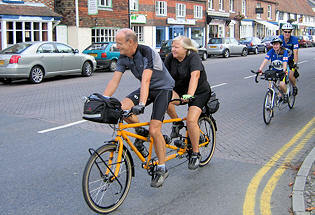 On a morning that dawned with 1 degree Celsius, 30 people decided to stick with the plan and go tandem cycling from Edenbridge. They were rewarded with the most amazingly sunny and wind-free day of cycling. 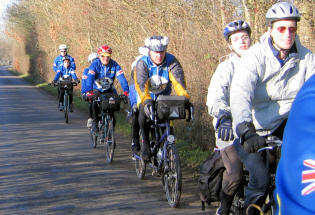 This was a joint Kent Group and South East London Group ride and it was good to see so many people out so late in the year. 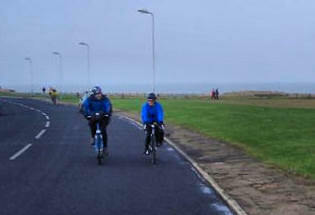 In fact this was the highest attended ride of the year with 14 tandems and 2 solos. 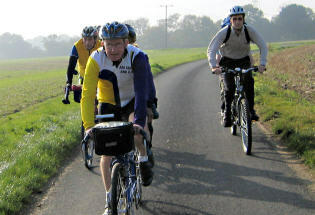 From this starting point (Edenbridge), it’s possible to have a gently undulating day’s ride but this was NOT our leaders’ plan… We started off in a north westerly direction and were soon climbing the very well named Pains Hill, which quickly sorted out those people whose granny gears could not readily be engaged, with at least one couple resorting to walking! With the excesses of Pains Hill and the High Chart completed, we descended in a northerly direction crossing the A25 and then climbing towards the looming North Downs. At the foot of the North Downs lies the M25 and the Clacket Lane Service Area, which was ideally placed for a Coffee Stop. Cyclists can get in via the Service Entrance in Clacket Lane but we did cause some eyebrows to be raised. Coffee completed, we now had to face the main ascent of the day to the highest point on the North Downs in this area, at Botley Hill. We then followed the ridge in a westerly direction for a couple of miles, with stunning views to the south, before the wonderful whiz down from 220 meters to 100 meters in less than 3 miles and into Godstone. Travelling southwards now through Godstone there was still the challenge of the evil Tilburstow Hill to be climbed and then the descent and the sharp and hidden left turn at the bottom. 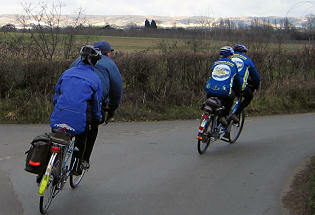 One tandem team overshot but all others made it round – just! Lunch was taken at the Brickmaker’s Arms pub on the outskirts of Tandridge – very accommodating people providing excellent tuck. I’m sure there’s a fairly gentle option from Tandridge to Edenbridge but this was not the route we took. Heading south eastwards now through Lingfield to Dormansland we found the very hilly terrain to the east of East Grinstead. The afternoon sun brought out the beautiful greens and golds of the autumn foliage, both on the trees and on the ground. There are lots of small steep hills in this area and just after Holtye Common when one couple, who were now functioning on three knees, saw a sign for Edenbridge, they took the easier option homewards. The rest of us continued in a north-easterly loop via the 1 in 7 to Markbeech but were rewarded with a long descent back to Edenbridge and huge pieces of apple cake prepared for us by Mary and eagerly eaten in the afternoon sun. It was an excellent day’s riding, excellently organized in weather that just could not have been better – it is November after all! Many thanks Harry and Mary. 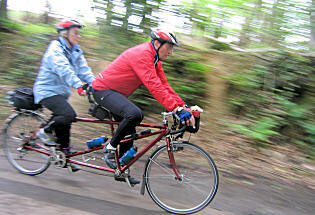 For an alternative report and more pictures, look at the Tandem Club - South East London website. 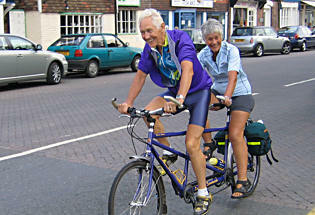 Cliff and Pauline will lead a short ride around the Kentish lanes with a pub lunch. Those who don’t wish to ride but want to join in the meal are very welcome. The table is booked for 1pm. What an excuse to get out of Christmas shopping. Contact Pauline for more information. 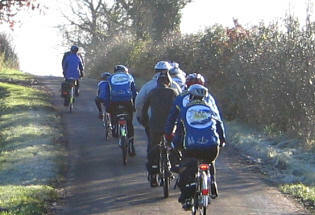 It was a cold, frosty, misty, sunny morning with no wind when six tandems and one solo set off from the top of the big hill at Pluckley heading in a southerly direction. Travelling along quiet country lanes we reached the A28 in Bethersden but this turned out to be a road too far as we had overshot the intended turn. We retraced our steps for a few yards and then headed in a westerly direction towards Wissenden and eventually, keeping to the quiet lanes, to Headcorn Aerodrome, where we stopped for coffee amid the controlled activity of this busy Sky Diving centre and ideal "Cyclists' Café". After a relaxed break, we now retraced our steps for about a kilometre and then headed in a north-easterly direction towards Pluckley. At least, that's what we thought but on several occasions, when a Pluckley sign-post appeared, we turned left and then after a while another Pluckley sign-post appeared with a greater mileage on display and again we would turn away. 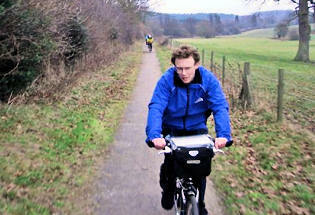 Eventually, at Swift's Green, we did start to head towards Pluckley, passing through Egerton Forstal and Mundy Bois. This was all part of leader Cliff's plan for us to arrive at the lunch stop at the right time and not too early. 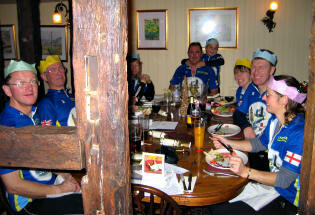 All the cyclists sat down for our special festive meal in the Black House pub (where we were also joined by John & Jean who had not been able to ride with us). 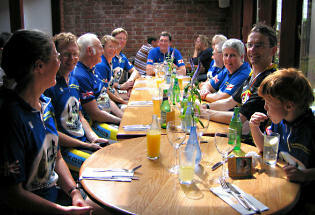 The meal was excellent and provided an excellent finish to the year of cycling with the Tandem Club Kent. Many thanks to Cliff & Pauline for organizing things for us.